Back in July it really felt like a good idea, I was in the mood for it and thought I have the time, but many things have changed. I played prototypes on the iPad but I can’t get it to the point where it’s ergonomic. Hovering over the screen aggravates pretty much the same muscles that for a guy like me are already strained to the max. If you put it on the table and control everything from one or two small touch areas (so your arms can rest) you have to look down all the time. The smaller devices have their own problems if you want to push ergonomics to the max. Due to some health related issues I have to reduce my time spent before the computer (that’s probably why I started to focus on ergonomics in the first place). To make a long story short: I currently can’t justify spending time on iHack related things. This may or may not change at any time. All the source produced so far is on github if anyone’s interested. This entry was posted in nethack, roguelike, slash'em on 2010/08/23 by dirk. Please post any issues you may encounter and feature requests right here. Or preferably fork the project and implement them yourself. I will happily accept patches (provided some quality guidelines are met). Enjoy the new UI, it might feel awkward at first, especially if you come from an iNetHack background, but I’m sure it will grow on you (as it has on the beta testers). Since it’s contextual it has its issues, but overall the game should be quite playable and enjoyable. If you ascend (haha …) *please* post right here too! This entry was posted in roguelike, slash'em on 2010/06/03 by dirk. With one of these Perl scripts and John’s master files for his Absurd Tileset I was able to build an up-to-date version for Slash’EM 0.0.7E7F3. The link behind the 32×32 version preview should lead to the full-blown 128×128 true color version, which is about 21 megs in size. If you have a tiled version of Slash’EM somewhere, I’d be curious whether this version got accepted smoothly or not. If you’re looking for Absurd 128×128 for Slash’EM 7E0, here it is (link removed, no longer available). Removed all links except the one to the 128×128 7e7f3 version. Corrected Slash’EM version numbers in the title and post. This entry was posted in absurd, roguelike, slash'em, tileset on 2010/04/01 by dirk. 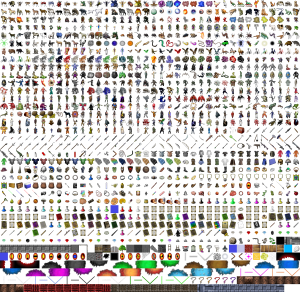 Please note that 0.0.7E0 is from 2003 and at least the order of some monster tiles have changed. 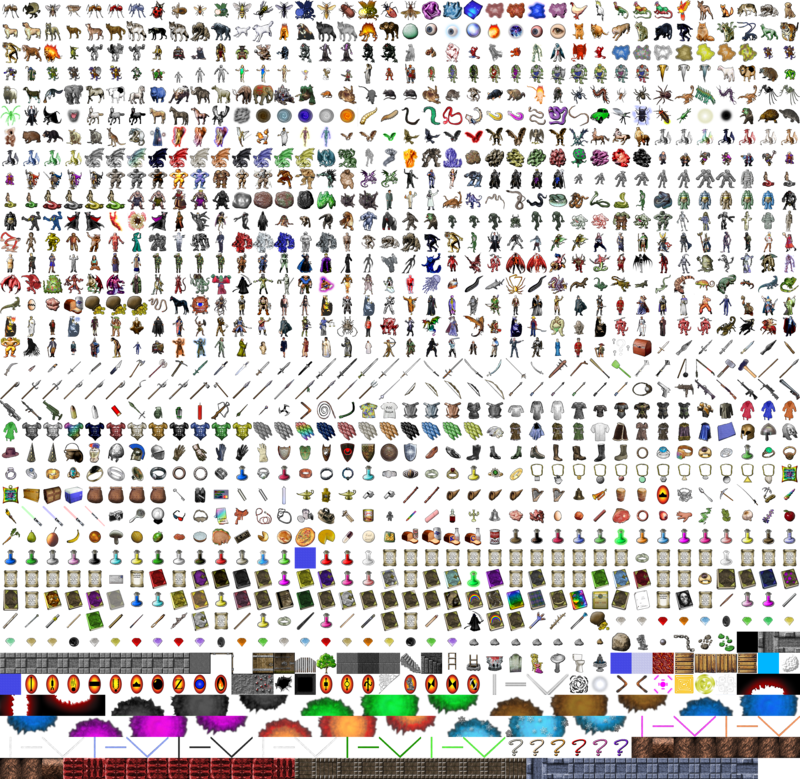 WARNING: The link leads to the 128×128 tileset, which is about 23 megs. And yes, I’m currently working with John to bring it to 0.0.7E7F3, the current Slash’EM release. 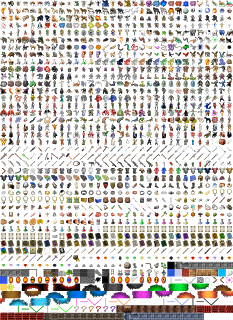 This entry was posted in absurd, slash'em, tileset on 2010/03/23 by dirk. 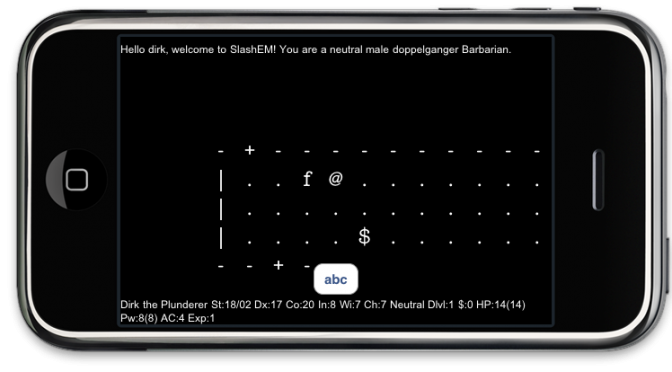 I recently started to backport the NetHack iPad codebase to the iPhone with the Slash’EM 0.0.7E7F3 core. The result is Slash’EM 1.0-b2 which is available as beta right now (signup required since some not so public information like device IDs have to be passed around). It’s not a continuation of the Slash’EM beta but a fresh codebase. The new UI is, like the iPad version, based on my iHack framework. It is inventory centric, letting you access most actions directly from the inventory view, offers context specific actions on a tap on your char (like untrap if traps are adjacent) and offers some shortcuts (e.g. the E-word is always just 2 taps away, no typing whatsoever required). This entry was posted in beta, slash'em on 2010/03/18 by dirk.